Most of New Orleans’ public housing was demolished after Hurricane Katrina, making way for new mixed-income communities. At four of the city’s largest projects, however, some buildings were preserved because the federal government considered these, designed and built of high quality materials during the New Deal era, to be historic buildings. As such, the agencies in charge of redevelopment ran a formal public consultation process before demolishing the structures. When I last posted about my masters thesis on historic preservation in New Orleans, I was writing about the preservation concept of significance. Significance determines not only why people think certain places are important to preserve, but also how governments and advocates act to preserve through legislation and legal means. Though the National Register for Historic Places and other regulatory bodies try to define significance, there are gaps in the criteria when it comes to recognizing that buildings house and represent communities, culture, and identity. I distributed stamped, addressed postcards in New Orleans as part of my thesis project. 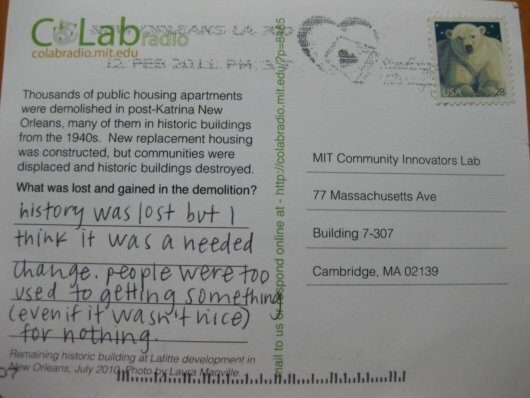 The postcards asked, What was lost and gained in the demolition (of New Orleans public housing)? 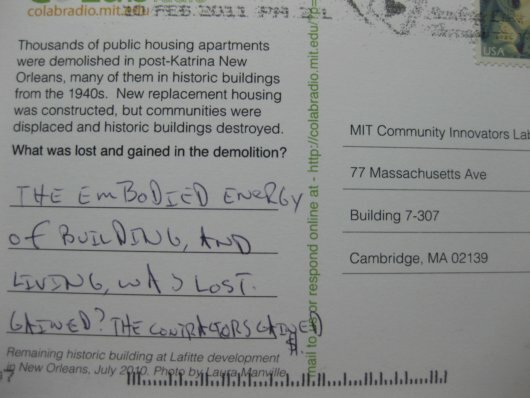 The returned postcard below says that “the embodied energy of building, and living, was lost” when the public housing projects of New Orleans were demolished. In my view, formal preservation processes could accommodate larger discussions about urban issues like cultural preservation, gentrification, and neighborhood change — all difficult topics that are inextricably linked to historic preservation. In New Orleans, for example, the redefinition of public housing and the new mixed-income communities will change how city residents interact with and perceive poverty in these neighborhoods. One of my suggestions for improving the formal Section 106 process was to broaden participation in preservation discussions. What happens to a historic built environment affects a variety of communities of people, not just architecture experts. In New Orleans, the Section 106 process for the public housing reached mainly self-described historic preservationists (and a few residents). But of the Mardi Gras Indian tribes who called the Magnolia projects home, or the musicians who have a connection to the project through neighborhood second lines, none were invited to participate as consulting parties. If preservation advocates want to increase their relevance and influence in underserved communities, broadening their reach is critical.